Birthday celebrations usually result in my spending hours trying to decide where to dine. There’s no better excuse for ramping up to a high-end dining experience. This year the location for my husband’s birthday dinner planned itself. I am heading back from a quick trip to Cleveland on a flight that gets into BWI just in time for dinner. It’s a no-brainer. 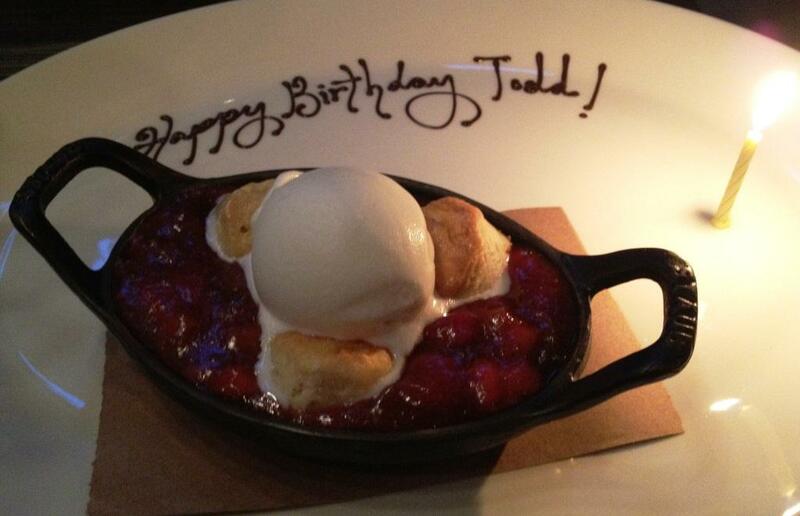 BWI+ Birthday Dinner= Woodberry Kitchen. Woodberry Kitchen, in Baltimore’s Hampden neighborhood, is actually not a high-end restaurant in the typical sense of the word. It’s got more funk and down-home appeal than razzle dazzle. But it’s allure is undeniable. 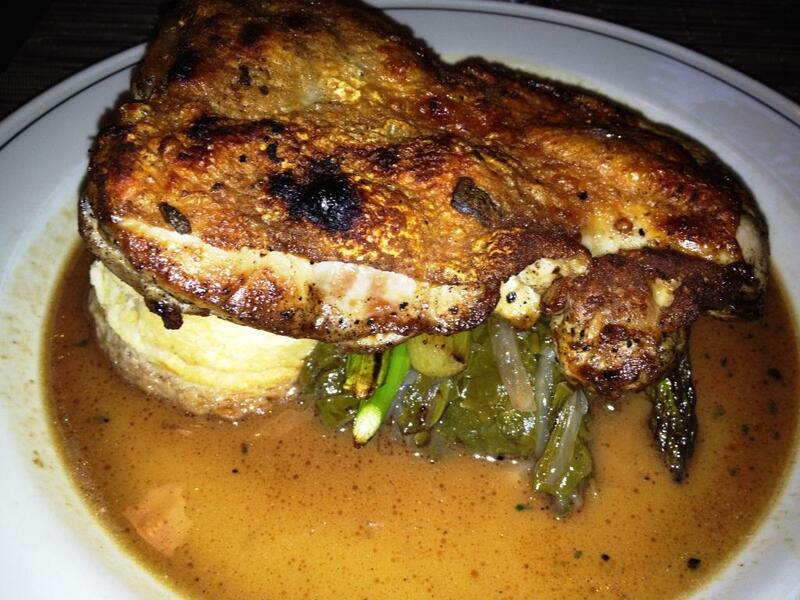 A charming atmosphere, skilled service, and great food put it high on my list. The fact that this Baltimore restaurant merits a spot on Washingtonian‘s 100 Very Best Restaurants 2012 speaks volumes. 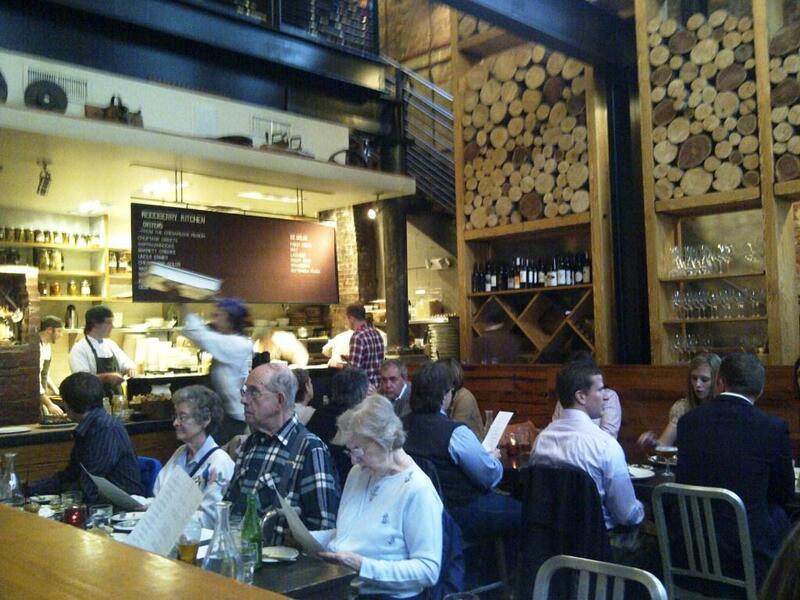 What really makes Woodberry Kitchen so special is Chef Spike Gjerde’s passionate commitment to local sourcing. * This wouldn’t mean a thing if he didn’t take those local ingredients and execute some pretty fantastic dishes. My plane is earlier than expected so I try to change our reservation. No dice. Fortunately, we are offered a high-top table near the bar as an alternative. No reservations needed. It doesn’t seem much different from the regular tables a few feet away, so we jump at the offer. Since we’re now dining on the early side we want to take things slowly. The cocktail menu offers some enticing options featuring local ingredients whenever feasible. My drink is the “Second Date” with House spiced rum, Bonal, crushed strawberries, honey, and Stephanie’s bay bitters. The fresh strawberries at the bottom of the glass have me reaching for a spoon. My husband has a “Manhampden” featuring Maryland-style rye, California sweet vermouth, new fashioned bitters, Peychaud’s, and an orange twist. We enjoy our drinks, taking in the attractive dishes breezing by us, as we try to decide what to order. Many restaurants boast a farm to table concept. You know it’s taken seriously at Woodberry Kitchen when you peruse the menu. 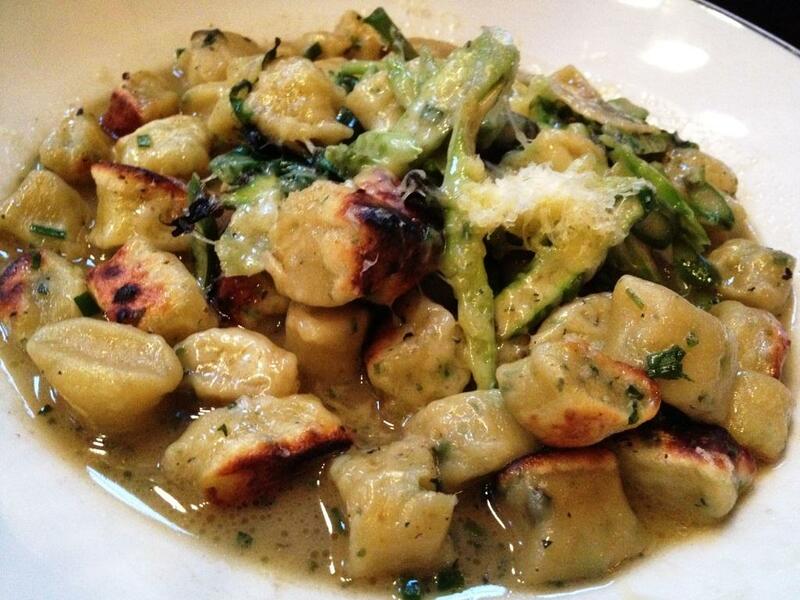 Ramps and asparagus are incorporated into nearly every dish, reflecting what’s truly in season at the moment. It takes about five seconds for for me – I mean us- to decide on a starter to share. I remind myself that it’s my husband’s birthday and this should be his choice. 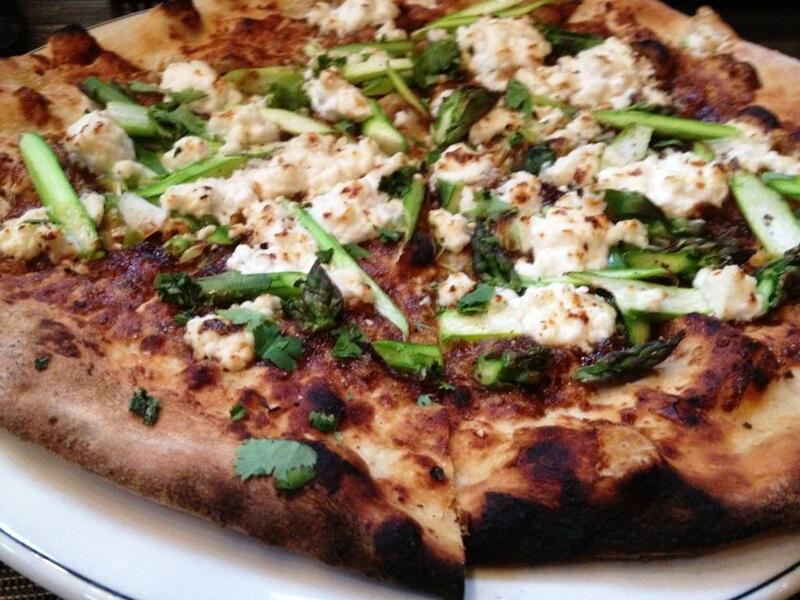 I’m hoping he’ll agree to the asparagus flatbread with green tomato relish, ricotta, and cilantro. I have to give him time to consider other options, so I hold my breath and wait. Fortunately, he’s in agreement. My first bite makes me gasp in astonishment. While I’ve ordered a flatbread with ingredients which I obviously find appealing, I am not quite prepared for flatbread perfection. The thin and crispy crust is what I always hope for and rarely receive. The combination of ricotta and cilantro surpasses my expectations. What gives the dish added depth is a delicate touch of sweetness created from homemade harvest chutney made from eggplant, tomato, and a selection of winter vegetables. I’m thinking I should select something with ramps from the supper portion of the menu. I’ve read countless tweets about ramps lately. I feel like I should join in on the craze surrounding this suddenly popular wild onion. This shouldn’t be difficult as it’s incorporated in almost every item listed. Except that the one I have my eye on is Springfield Farm Chicken & Biscuit with braised kale, asparagus, and an herb pan sauce. No ramps. I need the server to steer me in the right direction. She describes the chicken with a gleam in her eye which I cannot resist. She promises a memorable chicken dish with crisp skin and a tender and juicy interior. The kitchen delivers. The fresh greens and herb-infused sauce render me powerless against my brain, which tells me I am too full to go on. Just a few more bites, I tell myself, and then I’ll stop. Meanwhile, my husband is enjoying his entree of Cherry Glen ricotta dumplings with asparagus, ramp leaves, turnips, scallion broth, and ‘allegheny’ cheese. The flavor is more delicate than my dish, but there’s something alluring about the chewy, slightly crispy around the edges, texture of the dumplings. I’m coveting more than just a taste. Plus, this dish has ramps. Dessert is an easy choice when we are told that the strawberry rhubarb cobbler features rhubarb delivered that very day. Plus it’s topped with fresh cream ice cream. Fresh and fresher. It has slipped my mind that I mention my husband’s birthday when my reservation is confirmed. The staff at Woodberry Kitchen, however, remember. Fresh, local, seasonal, sustainable, farm-to-table, slow food. These are concepts that are being embraced by chefs around the country, as they should be. Woodberry Kitchen takes them to a higher level. One where you feel good about the food you are eating, and where flavor and value run rampant. *A recent article by David Hagedorn in The Washington Post details how Spike Gjerde’s commitment to local sourcing plays out at Woodberry Kitchen. Sounds unbelievable. Can’t wait for my next trip from BWI!